This review examines a natural supplement called Sparta Nutrition Cogni Keto. This supplement is designed to improve mental energy and focus by shifting the body into a ketogenic state. A ketogenic state produces organic molecules called ketones, which the brain can use as an energy source. Ketones cause the brain to develop more energy producing cellular components called mitochondria. There are other benefits to a ketogenic state like weight loss and improved stamina. In this review, we determine if the supplement has the right formulation to help you generate the best ketogenic state you can. The beta hydroxybutyrate salts contribute minerals that can help the body to function properly. For example, sodium and calcium are involved in muscle contraction. The beta hydroxybutyrate is a ketone, so increasing levels a bit in your body will shift you into ketosis. Ketosis is a state where the body metabolizes fat as a source of energy in preference to carbohydrates. That’s why some of the ingredients in this product like medium chain triglyceride oils and alpha GPC (both of which are fatty molecules) are included. The remainder of the ingredients can either be used as an energy source or to help stimulate lipolysis, the breakdown of fat. One scoop of this supplement, which is a powder, can be taken once a day with 8 ounces of ice cold water. A customer may use two scoops a day once they develop a tolerance but they should not exceed this dosage in a 24-hour period. The only ingredient customers would really feel side effects from is the caffeine. Caffeine can cause insomnia and restlessness as well as stomach irritation and nausea. Some people may have a particular sensitivity to caffeine so they should be careful. Other than that, pregnant and nursing mothers and people who take chronic medication should consult their doctors before using Sparta Nutrition Cogni Keto. 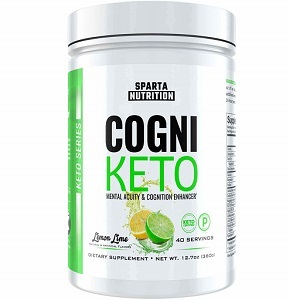 12.7 oz of Sparta Nutrition Cogni Keto (which contains between 20 and 40 servings depending on how you use it) can be bought online for $59.99. This price does not cover shipping or taxes. The manufacturer provides free shipping on all orders that are over $99 though. This manufacturer doesn’t offer a guarantee but they do have a returns policy. Products may be returned to the manufacturer if they have not been opened and the manufacturer is notified within 14 days of delivery. This return gives the customer credit for other options and not a cash refund. International customers outside of the USA should be warned that there are no returns on internationally ordered products. This product contains a few good ingredients and the directions for use are quite easy to follow. However, this manufacturer does not offer a guarantee on their product, so they don’t give the customers a chance to test if the product is effective or not. That’s quite a high risk to be taking when spending $60 on a supplement. John Parker	reviewed Sparta Nutrition Cogni Keto	on November 10th	 and gave it a rating of 3.